The government's 2015 Autumn Statement announced that it intends to end the payment of student bursaries for nursing, midwifery and allied health professional students - as proposed by the Council of Deans of Health - from 1 September 2017. This has been met with anger and alarm. 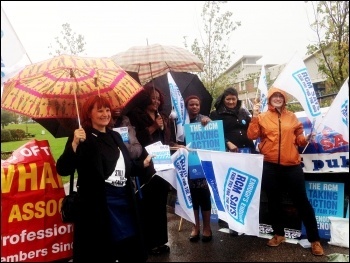 NHS workers under attack: The attack launched on student nurse bursaries underlines the continued campaign the Tories are conducting against our NHS. NHS spending is at its lowest as a percentage of GDP since 1951, and the treasury is demanding a further £22 billion worth of cuts by 2020. 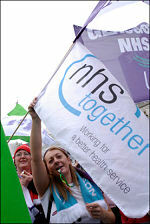 Our NHS is ill. Its health is worsening. Like someone with cancer, symptoms appear in different parts of its body although it just gets by day to day. 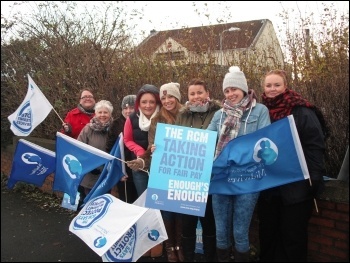 Pay cuts: Angry and ready to strike! I'm a first-year student midwife at a Birmingham NHS trust. I was well aware of the realities of the job before I started the course, from the grave responsibility of ensuring mother and baby are alive and well, to dealing with abusive families and social services matters, to coming home drenched in all manner of bodily fluids. Plans 'unfit for purpose'? 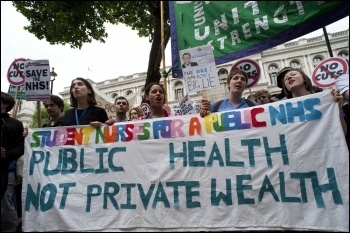 : 'FIT FOR the future,' the government's plan for NHS services in North-east London, would be better entitled 'Unfit for purpose'! It will mean downsizing King George Hospital and possibly Whipps Cross Hospital, closing their Accident and Emergency (A&E) departments and moving them to a 'super-hospital' many miles away - the PFI-built Queens Hospital in Romford.